I’ll admit it. I’m not above comics. In fact, I read every Foxtrot collection that comes out. Most of the Dilberts, too. And why not? There’s no rule saying that everything you read has to be 200+ pages of seriousness with chapters, end notes, and an index. Comic strips can be every bit as funny as Bill Bryson recounting a walk in the woods. Just not as complicated. And Charlie Brown & company have probably expressed more wisdom per word than anyone you can name. Peanuts books outnumber pencils in my house and my daughters have read my well-worn Calvin and Hobbes collection — the greatest comic strip in the history of the world — more often than I’ve dusted the cobwebs near the ceiling above the stairway. 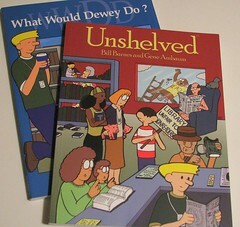 When two cartoonists appeared at a library meeting and stirred everyone into a fit of laughter with their interpretation of the “library biz”, I simply had to give a couple of their books a spin: Unshelved [LibraryThing / WorldCat] and What Would Dewey Do? [LibraryThing / WorldCat]. Bill Barnes and Gene Ambaum started publishing their Unshelved strip on the Internet six years ago. You wouldn’t think there would be much of a market for a comic strip set in a library, but it has slowly built up a loyal audience within the profession and has many fans outside as well. The strip stars Dewey, a male librarian at the Mallville Public Library. His cynical outlook is a perfect balance for his hoping-to-please-everyone boss. There’s a odd collection of other regulars in the cast, including someone with a mysterious background permanently stuck in a summer reading program full-body beaver costume and a pre-teen boy who does everything in the library EXCEPT read. There’s also an endless stream of library patrons with questions, comments, and needs. Real-life library staff can identify with many of the situations and chuckle in a “been there, done that” sort of way. Non-librarians (i.e., real people) can enjoy the workplace humor set in a familiar public place. If an engineer (Dilbert), a viking (Hagar), or a dweeb (Jon in Garfield) can have a comic strip, why not a librarian?